about this book: Enda Osin and his wife and fellow journalist, Jessica Du Ross, stumble into another political scandal in the second of the Enda Osin Mystery trilogy. To help them is Enda's right-hand man 'Fish,' a cheeky ex-con from the East End of London. Two rival aviation companies are battling to win orders for the first hyper-speed commercial and military rocket-craft. The American Orbit company have solved a stability problem and are due to fly. Weimer Aviation, part of an EU consortium, are also trying to solve the same problem. When the German CEO of Weimer receives an offer from a disgruntled Orbit engineer, he immediately has his security adviser, Voss, organize the delivery of the stolen technology. Unknown to the CEO, Voss and the engineer are members of a Russian cell of spies headed by a clever British mole who has been embedded in MI5 for over twenty years. Moscow wants to re establish a balance of world power by flying hyper first with a craft of their own that can carry a nuclear warhead and reach any point around the world within an hour.The problem the Russians have is making sure that no-one knows they have stolen the technology. They want the Americans to think the Europeans have stolen it. Orbit and Weimer have a history of legal actions involving libel dating back to a Weimer crash. Krane, the mysterious head of the spy cell, knows Enda well enough to know how he will react in certain situations. He sets an ingenious plan in motion that lures Enda into thinking he is about to uncover industrial espionage and corruption within the EU while delivering the plans to Weimer in Berlin. In a thrilling trail of discovery and betrayal through London and Europe, Enda, Jessica and Fish are pursued by the police and the Russians in a deadly cat and mouse chase. After discovering that the plans have been altered by the Russians that will lead to the craft exploding at hyper-speed, Enda must stop the flight and expose the mole. In a final double twist, a Russian goes back to Moscow, the Americans get a present from Enda and Fish reveals a shocking secret. In the first book, Enda met the beautiful West Indian Jessica Du Rose and worked together with her to solve his case. Now in this second book Enda and Jessica are happily married, which I was really glad to hear about. Enda receives a strange call asking him to pick up and deliver a package, which makes him highly suspicious of the whole deal. He soon figures out that the call to him might have been a mistake, and by taking the courier's identity and following through with the delivery, he might just uncover an espionage plot of industrial proportions. What soon Enda discovers is that there are two major corporations both involved in industrial espionage, who are competing against each other to bring a particular product (hyper speed aircraft) first to market. The problem, however, is that people are dropping around Enda left and right, so now he has not only the big competing companies on his tails, but also various agencies, who are not so sure he is innocent of the crimes. The plot is quite suspenseful – I found it to be more so than the first book in the series – and the action doesn't let go even for a minute until the very satisfying end. Enda Osin's world is a rich one, full of interesting characters, some which do seem unsavory, but turn out to be anything but. Twisted wire is a complex spy thriller. The prologue introduces us to Nigel Silsbury, a spy who is searching for the mole in MI6, a man known as Krane. Enda Osin is a political reporter for the Herald newspaper, he returns from holiday to a strange message on his phone. He follows up the lead and finds himself involved with industrial espionage and the theft of material about a high-speed experimental air craft. The storyline involves the Americans, Russians, the EU and the British secret service in a plot line with plenty of twists and turns as spies are exposed, sabotage planned and deals are double crossed. Enda Osin, his wife Jessica and a handy right hand man called Fish sniff out a story and try to help justice win. Determined to be able to get a story for the paper Enda goes to great lengths and takes huge risks as he follows a trail to Germany and Europe. Looking for a true spy novel.. Looking for a true spy novel that's as twisted as the title of this one? Look no further. This second book in the Enda Osin series by Ray Stone takes the reader on a wild ride from England to Belgium and back, with double and triple crosses. Enda Osin is a correspondent for a major British newspaper and never turns down the opportunity to investigate political intrigue. At the beginning of this volume, he finds an odd message left on his phone, one he believes was meant for someone else. Unknowingly, he has been friends since college days with a Russian mole in MI6, who has now found a way to use him as a courier. He will be bringing critical information stolen from an American firm developing a hyper-speed aircraft to the head of the company producing a similar aircraft for the European Union. In actuality, this information is permutated and will cause the EU aircraft to crash, while the original plans will be sent to Russia, to ensure that the Russian hyper-speed aircraft is the only one to successfully fly. Enda senses something is going on from the get-go and decides to go ahead with his apparent role in the plot, knowing that he is becoming embroiled in a dangerous situation that could mean jail for him but anxious get the story for his paper. MI5 and MI6 cannot be trusted because they are playing politics with each other as well as with Russia and the USA, and soon Enda is on the run from a ruthless Russian agent, Voss, who is linked to several other dubious characters. No one is who she or he is supposed to be except for Enda's wife, the beautiful Jessica du Ross, and a man he has used previously, Fish, a jack of all trades. Or is he? If there is a downside to this book, it is the unbelievably complex plot, which is cleverly constructed, but leaves the reader at times not knowing who is who. It ends in an unexpected double twist. Political intrigue, industrial espionage, and games played between M5 and MI6 are just the beginning to this thriller that brings the Herald's political columnist, Enda Osin, into the vortex. Add Moscow's fingers in the pie, a mole in the British secret service, and an enigmatic telephone call, and "Twisted Wire" becomes a thriller worthy of other great "Spy versus Spy" genres. Enda Osin is a political columnist who, in this second of Ray Stone's trilogy, becomes accidentally involved in a ginormous political scandal when he receives a mysterious telephone call from a seemingly wrong number. Enda finds himself caught in one of the most thrilling and nefarious adventures ever published in a novel. "Twisted Wire" has richly developed, unforgettable characters. They are believable and three-dimensional. 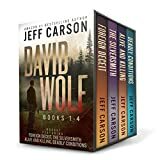 Ray Stone displays his talented ability to keep the story interesting and organized, while moving along quickly with just the rightly placed twists that the reader would expect. The dénouement is, indeed, a grand surprise, and I will leave it to future readers of "Twisted Wire" to discover it as I did. I was excited to receive this book to read before it was available to the public and I truly enjoyed the story and characters. Enda gets himself, his wife and Fish involved in the world of industrial espionage and spies by following the instructions in a mysterious phone call. What follows is an interesting story full of twists and turns, friendship and unexpected developments through out. Enda finds out that not every one is trustworthy but also he has true friends that help in times of need. Every new book is better than the one before! This one has all the elements of a great story: vibrant characters, plenty of cliffhangers, and a plot so current it could have been taken from the Sunday London Times. Once again, we get the opportunity to see the world through the eyes of our favorite jaded, sarcastic and obsessive political reporter, Enda Ocin. Enda has now settled into married life with the beautiful and proper Jessica Du Rosse. A new character named Fish, Enda's man Friday, has talents that constantly amaze Enda. As usual, the beauty of Ray Stone's writing is his gift for writing characters so real and unique you could spot them in the crowd at Time Square on New Year's Eve. 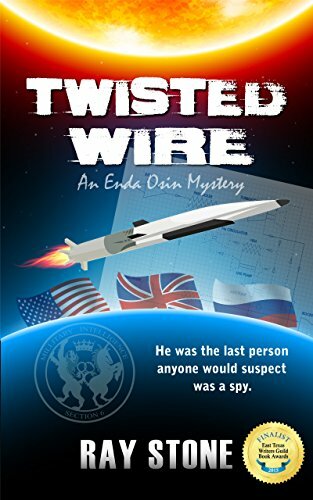 I was excited to receive a copy of Twisted Wire from Ray Stone in advance of its release. I've read all of Ray's books to date and this one is definitely the leading edge of a body of great work. Ray Stone writes devilishly intricate plots, interwoven with great action, twists and most importantly realistic and enthralling characters. Enda Osin is unforgettable and engrossing as the bulldoggedly curious political journalist who just can't keep out of trouble - anywhere. If it's not with the governments he writes about, it's with his editor Max - or with his equally engaging wife,Jessica. Jessica is everything that Enda isn't: beautiful, sophisticated, elegant and thoughtful. Together, they take on the world once again and it's a real page-turner to see what they uncover and if they come out of it unscathed. I highly recommend this book and this author to anyone who enjoys a good thriller. And I encourage you to read the first Enda novel, Isia's Secret, as well. In fact, get them both together and binge read your way through Enda's adventures. You won't be sorry. Twisted Wire is another in the Enda Osin series where, as an investigative Journalist Enda receives a mysterious phone message about a parcel and although counselled by his young wife, Jessica, to not 'start digging something up…' he follows up on the address in the message because it seems familiar. Unable to ignore the questions raised by the parcel and the message Enda begins on a trail that uncovers international espionage that takes him to Germany and other parts of Europe. Jessica, who takes on the role of research assistant, travels with him. These two are very well portrayed. We hear the story from Enda's point of view but Jessica plays her part right up to the point where Enda is devastated by the prospect of losing her. They work as a team and neither upstages the other. However, it is an Enda Osin story and he is never too far from the action. The story is told from two points of view – Enda's and the point of view of the perpetrators representing agencies competing for the advanced aircraft technology. As a reader who likes to see the characters live on the page I found the character of Fish very appealing. He was believable in every way. He spoke and behaved as I would expect him to and he was an excellent contrast to Jessica and Enda. Loved him! Scruffy, unreliable and unexpectedly turning up at critical times. I hope he's in the next book. Olga who has a tattooed face, I'm not so sure about. I found myself wondering how someone with such distinctive markings could hide from the Russian agents who were chasing her. So I wondered what the tattoos were like. Now a bit about the plot without giving too much away. Once again journalist, Enda cannot resist following a lead that has the air of mystery and intrigue about it. He intercepts delivery of a memory stick on which are classified plans for the SX56 hyper supersonic aircraft, the next big thing in international weaponry. The superpowers are after this highly classified information and want to be first to build it. Enda senses a good story and nothing can stop him following his journalistic instincts which lead to a race from Europe to UK involving people at the highest government levels. Enda and Jessica dodge the bullets and get the plans into the right hands but not without huge risk to themselves. As in 'Isia's Secret' he acts against government advice and runs the gauntlet but emerges to tell his story. The story has pace and is complex plot-wise. This is a step up from his first novel, 'Isia's Secret' and I look forward to reading the next in the trilogy. With Twisted Wire, author Raymond Stone has eclipsed his first novel, Isia's Secret. His latest mystery thriller takes you at a fast run through international corporate espionage as Britain, Russia, and America compete for contracts worth billions. Twisted Wire may be about a piece of technology engineered to go wild, but it also apply describes Stone's intricate plot twists, complex in their crafting and timing. Jessica Du Rosse returns as Enda Olsin's rational foundation and conscience. A true partner in this adventure, her support and counseling keep Enda on course and on his toes. The story is told with a style that makes it entirely plausible and possible, leaving the reader free to enjoy the fast paced character and conflict. Enda also chooses his sidekicks carefully and his choice of Fish is a gem to be remembered and anticipated in future stories. Another thriller from that British ex-pat. His use of geography and thrilling plot twists are much better in this the second volume in Enda's life story. His use of UKism's makes this read even more enjoyable, even if he can't spell like us colonials! I'd highly recommend this thriller suspense to anyone that has every read Clive Cussler, Ken Follet or James Patterson novels. His details are hard to break, yet he stills leaves a lot to your imagination. I felt dirty in the plot along with the characters. I for one am waiting anxiously for the next Enda story to unfold! Super glad to receive 'Twisted Wire' for review before it is published. After reading 'Isia's Secret', I couldn't wait to read another Enda Osin mystery. Enda, now married to Jessica, gets involved in industrial espionage. After receiving a strange phone call regarding delivery of a package, Enda decides to investigate and uncover a good story for the Herald. In this part of the trilogy Fish who is an ex con joins the team. Enda and Jessica discover that two giant companies are competing to get access to advanced technology in order to develop a hyper-speed aircraft. Everything gets complicated when intelligent agencies become involved and little by little Enda and Jessica enter into a web of political intrigue without knowing who they can trust. As I expected, 'Twisted Wire' is another well-crafted thriller by Raymond Stone. New characters like Fish are described vividly and the plot is so thrilling that you will read it nonstop. Stone keeps the style of his previous book as Enda's POV mixed with an omniscient POV. Ray Stone has written a fabulous piece of fiction and the second in the Enda Osin trilogy. To date I would say this is his best work. Enda Osin, political columnist, once again becomes embroiled in a political scandal, this time of huge proportions. A strange call from a wrong number and Enda is investigating. What he gets into is political intrigue and scandal followed by sabotage and murder. The stakes are high and lives are at risk, especially Enda's. With assistance from a few dedicated people, some strange, some not so, some out to settle a score, and all of them willing to risk their lives to help Enda get to the truth, they embark on a most dangerous mission. The characters are wonderful and true to the part they play. I loved them, especially Fish, who enters the story early on and is an integral part. The action scenes are well-written and I had trouble putting the book down, wanting to see what would happen next.